In 1964 he built his pride and joy, a 1938 Chevy Coupe, a car he still races with a few modifications. Jim had many wins over the years. 1966 was a milestone, he was the winner in the A/Modified Production Class running 103.40 mph in 13.30 seconds at the Canadian Nationals at Mohawk Drag Strip in Deseronto, Ontario. At the end of the 1971 season, he took some time off to devote to his family and business. Thirty years later, he decided he would like to race again. 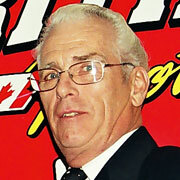 So in 2002, with his son Brian at his side, they became a two-car D’Arcy Racing Team (Jim using his same ’38 Chevy Coupe). In 2006 he could still produce the best time. He said over the last 44 years there has been a lot of changes in drag racing and the driver.